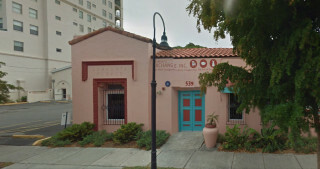 In October 2012, the Woman’s Exchange bought a parcel located at 526 Rawls Ave., just north of its existing historic structure in downtown Sarasota. “We purchased the property with the goal of using it as part of an expansion,” the nonprofit’s CEO, Karen Koblenz, told The Sarasota News Leader in a Dec. 21 interview. The goal was to help “streamline” the organization’s operations, she added. But since the organization officially announced its plans in April 2014, the expansion — specifically the addition of a loading zone at 526 Rawls Ave. — has drawn the opposition of nearby residents, a number of whom have voiced worries about delivery traffic and the project’s compatibility with the adjacent Laurel Park neighborhood. 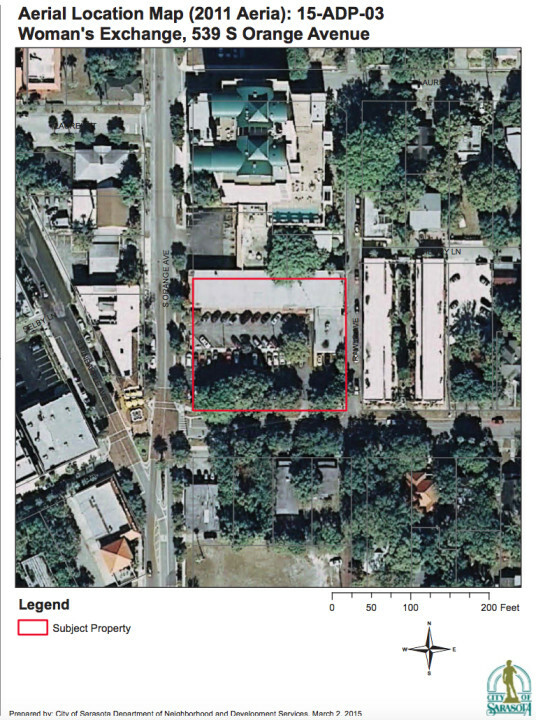 The City of Sarasota’s granting of a construction permit for an addition that will include the loading zone will be addressed during a public hearing next month as part of a special meeting of the city’s Planning Board. During the Jan. 20 session, the board will hear from the Woman’s Exchange and the Laurel Park Neighborhood Association as it considers the appeal, which was filed by the Laurel Park Neighborhood Association and three property owners. The appeal protests not only city staff’s issuance of a building permit for the loading area but also its approval of the site plan for the 3,524-square-foot expansion to accommodate furniture consignment. Koblenz said the Laurel Park group’s opposition has forced the nonprofit to spend $54,071.84 to-date on legal fees to pursue a project that she says clearly meets the city’s zoning regulations and would help the growing organization operate more efficiently. In the meantime, she noted, building costs have been rising, and the organization also will have to cover the expense of the appeal process. “The Woman’s Exchange has been put in a position of having to defend their property rights, even though the land purchased is commercially zoned ‘Downtown Core’ and the new wing is being built 100 percent to code, requiring no exceptions or variances,” Koblenz pointed out. The Laurel Park Neighborhood Association — which has long contended that the loading zone is not a compatible use on narrow Rawls Avenue — filed its appeal Nov. 24. The Jan. 20 hearing will be the latest event in a debate that has pitted one of downtown Sarasota’s most historic neighborhoods against the growing nonprofit. The Woman’s Exchange is one of only two individual buildings in Laurel Park listed on the National Register of Historic Places, Koblenz pointed out, and it is the only commercial structure within the historic Laurel Park district. The appeal is the first filed under the City of Sarasota’s Laurel Park Overlay District, approved in August 2013 in an effort to buffer the neighborhood from the types of structures allowed under the downtown zoning at its border. That overlay, Koblenz noted, is the only one of its kind in the city. Although the Woman’s Exchange’s proposed expansion may be allowed under the city’s Zoning Code, the organization is also obligated, according to that code, to address compatibility issues, said Kate Lowman of the Laurel Park Neighborhood Association. “There is language in the code that calls for [city] decision makers to consider compatibility, and our basic argument is the compatibility issue has not been considered as seriously as it needs to be,” Lowman told the News Leader. As of the News Leader’s deadline this week, Lowman said Laurel Park residents were busy with preparations for the holidays, but they would soon be getting ready for the Jan. 20 hearing. Homeowners and people who own rental properties in the neighborhood will likely attend the Planning Board session, she added. “We wish that the Woman’s Exchange had found a way to build what they wanted to build in order to expand while still being sensitive to the neighborhood,” Lowman said. Lowman points to recent projects, including the Kanaya condominium complex — located at 505 S. Orange Ave. — and a proposed development on property owned by real estate magnate Michael Saunders — at 495 and 307 S. Orange Ave. — that included significant buffering to provide some type of transition into the neighborhood. However, representatives of the Woman’s Exchange declined to offer alternatives or work on a compromise with the neighborhood, especially when it came to the location of the loading area, Lowman told the News Leader. The Woman’s Exchange leadership has emphasized the need for an expansion of its facility, which dates to 1926. The 3,524-square-foot expansion and loading zone would facilitate a more efficient intake process for consignment merchandise, Woman’s Exchange consultants said during the March 11 Sarasota Planning Board meeting. The Planning Board this spring rejected requested adjustments to the Zoning code associated with a different aspect of the nonprofit’s proposed expansion, but the Woman’s Exchange proceeded with the Rawls Avenue segment, city documents show. 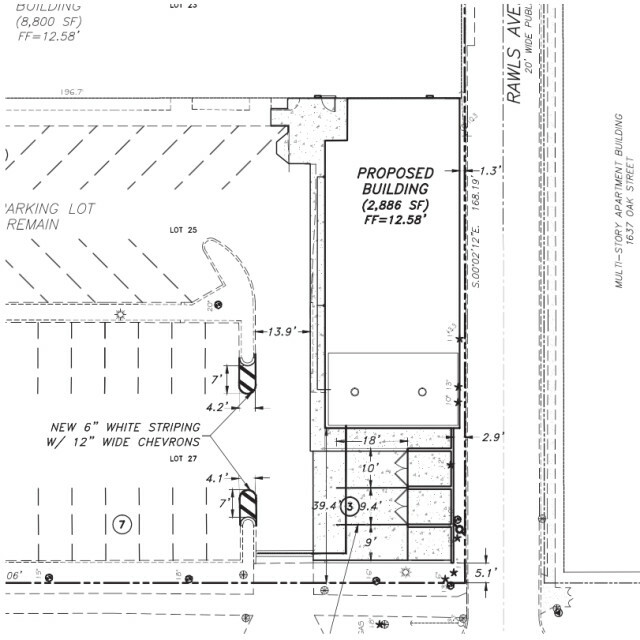 City staff members later gave administrative approval to the site plan for the structure with the loading zone. 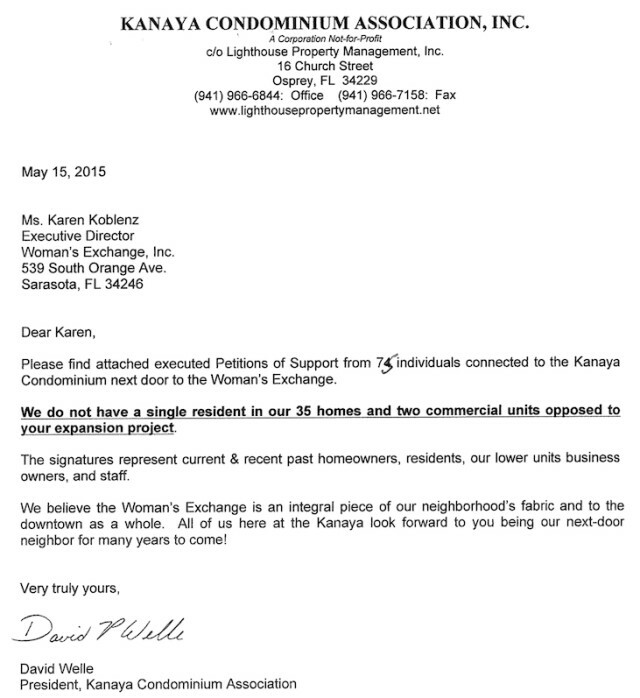 Over the coming weeks, Woman’s Exchange representatives —including planning consultant Joel Freedman of Sarasota and attorney Brenda Patten — will also be preparing for the January appeal hearing, Koblenz said. The property at 539 S. Orange Ave. that houses the nonprofit has been paid for by the Woman’s Exchange, Koblenz pointed out; the organization not only wants to stay there, but it also wants to be able to expand. “This is our home, so why not try to remain in your home,” Koblenz said. According to the Sarasota County Property Appraiser’s Office, the Woman’s Exchange purchased the nearby 4,598-square-foot parcel at 526 Rawls Ave. for $275,000 on Oct. 31, 2012. The Woman’s Exchange website explains that the consignment store has been dedicated to the support of Sarasota and Manatee counties’ local arts community since its inception in 1962. Koblenz said the nonprofit has donated more than $1.3 million to local arts organizations in the past five years alone. Lowman told the News Leader that during a recent general meeting of the Laurel Park Neighborhood Association, discussion arose regarding whether the group should appeal the city’s issuance of the building permit. With about 40 residents present, a straw vote was held on the matter, she said, and the vote was unanimous in support of the appeal. Although Laurel Park will have its opportunity to state its arguments during the Jan. 290 hearing, the group had hoped to bypass that step and appear directly before the City Commission, a request the neighborhood association formally made to the city. A Nov. 24 letter the Laurel Park group sent to Mayor Willie Shaw argues that while one Planning Board member already had recused himself from earlier discussions because of his involvement with the project, Planning Board member Robert Lindsay — who was not previously required to recuse himself — might not be counted upon to cast an impartial vote on the appeal. Lindsay is the son of Elizabeth Lindsay, co-founder of the Woman’s Exchange, the Laurel Park Association pointed out. However, city officials determined the appropriate course of action is for the appeal to go before the Planning Board first. “The Zoning Code provides that the appeal must be heard by the Planning Board before a subsequent appeal is made to the City Commission,” reads a Dec. 17 letter from City Attorney Robert Fournier. 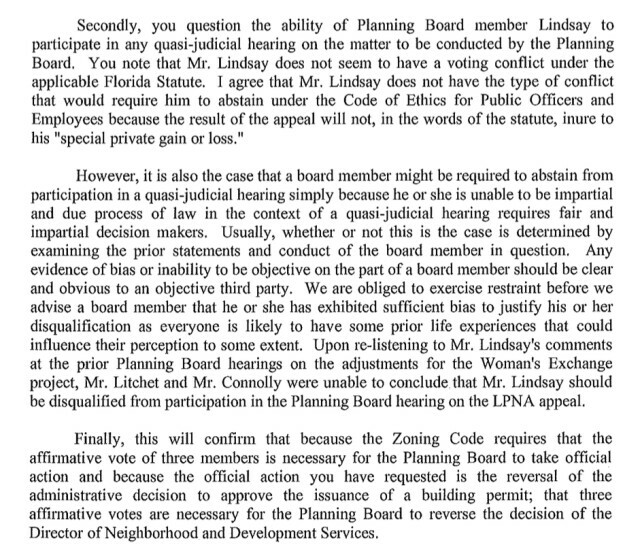 Fournier’s letter also reaffirms an earlier decision that, under state law, Lindsay does not have to recuse himself from discussions regarding the Woman’s Exchange, including the Jan. 20 hearing. “I agree that Mr. Lindsay does not seem to have the type of conflict that would require him to abstain under the Code of Ethics for Public Officers and Employees because the result of the appeal will not, in the words of the statute, inure to his ‘Special private gain or loss,’” Fournier added.